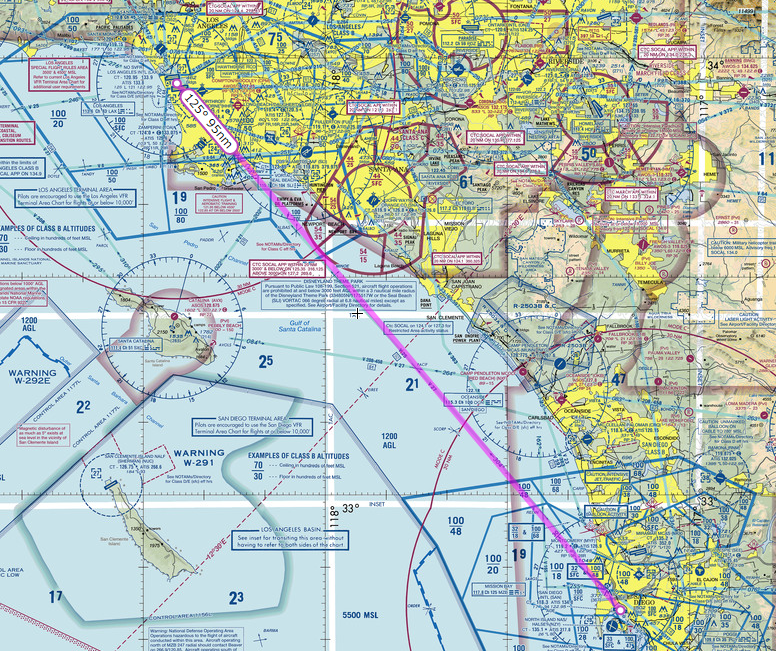 Conduct a flight from Los Angeles International Airport (KLAX) to San Diego Lindbergh Airport (KSAN). Learn radio communications when operating at Class B airports. Fly from KLAX to KSAN. Inform ATC on initial contact at KLAX that you are performing the CAT-11 Rating. Undoubtedly, you’re aware of this by now, but Class B airspace is the most restrictive airspace that VFR aircraft has access to and is located around the busiest airports in the country. Departing a Class B airport follows the general flow of departing a Class C airport. First you will contact Clearance Delivery in order to obtain a Class Bravo clearance and departure instructions. You will want to tell Clearance Delivery your aircraft type, cruise altitude, destination, and ATIS code. If you don’t have a specific destination you can provide a general direction of departure. Additionally if you desire flight following once clear of the Class B airspace you should advise clearance delivery in your initial call. Clearance Delivery will provide initial departure instructions, a departure frequency, and a transponder code. Again, this bears a striking resemblance to a Class C Departure, does it not? After departing you should expect tower to instruct you to contact departure. At this time you should tune in the frequency that Clearance Delivery provided in your initial departure instructions (the frequency that you dutifully wrote down, right?) and check in with them. Departure will provide Class B services until you are clear of the Class B airspace. At this time you will either be instructed to squawk VFR and that a frequency change is approved, or provide flight following services (if previously requested). Arriving at a Class B airport is simply the reverse of departing. Around 40NM from the airport and prior to entering Class B airspace contact approach control on the frequency listed on your VFR chart. On initial contact you should provide your callsign, location, altitude, request, and the ATIS code. Approach control will provide a transponder code and once radar identified a clearance to operate in the Class B airspace. Make sure you get a clearance prior to entering the airspace. Approach control will advise you to contact tower at the appropriate time. Aircraft that are receiving flight following will automatically be provided Class B services once they enter Class B airspace. No specific action is required by the pilot to initiate these services. Once again make sure you are given a Class B clearance prior to entering the airspace. Note, your departure instructions will be quite different if you haven’t requested flight following. They will instead advise you to make a left turn at the shoreline without a departure frequency, after which tower will drop you like a Potato En Fuego. N123AB: “Contact SOCAL Approach, 127.40"
N123AB: “Contact SOCAL Approach, 128.10"
Switch to 128.10. Begin considering the specific brand of gin for the post-flight drink. As we are getting closer to San Diego, this would be a good time to get the ATIS….and some ice. SOCAL Approach: Cessna 123AB, SOCAL Approach, San Diego altimeter 29.93, expect runway 27, cleared into the San Diego Bravo airspace." When 10NM From KSAN expect approach to hand you off to tower. Assuming the plane is still usable, pick up any pieces that fell off during the landing and clear the runway.